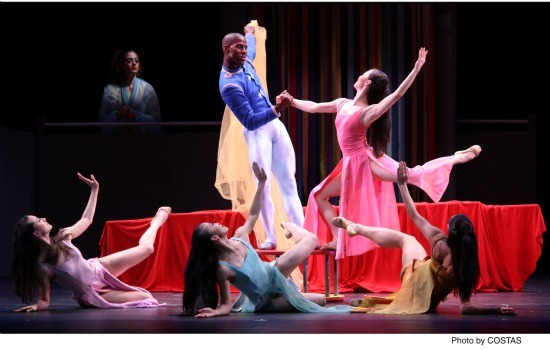 Lloyd Knight and Xiaochuan Xie in Martha Graham's Every Soul Is a Circus. 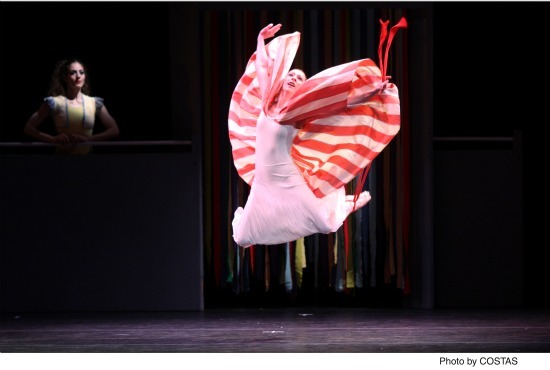 The program that the Martha Graham Dance Company presented on the opening night of its Joyce Theater season (March 13 through 18) concluded with a gripping performance of Graham’s 1947 masterwork Night Journey. The audience clapped and cheered and rose to its feet. In my heart, I muttered, “That’ll show them.” Show whom what? Show the world? Show the directors of the company that audiences can take their Graham neat, that they don’t need explanations and works by others that riff off Graham’s themes? But is that last true? There are realities faced by the company’s executive director, LaRue Allen, and its artistic director, Janet Eilber, that I don’t pretend to understand and financial issues I’m not privy to. God knows the survival of a company after the death of its founder and only choreographer grapples with problems of integrity, preservation, and innovation; marketing takes expert log-rolling. The Joyce season—like the one last year— had a theme. This time it was “Inner Landscape.” To set up that image, the programs opened with a short film, Beautiful Captives, created by former Graham company member Peter Sparling. Black-and-white film clips of Graham dancing some of her beleaguered heroines swirl within a collage of images from various noir films and thrillers, while raging music plays and the voices of movie shrinks counsel Bette Davis or Olivia De Havilland. In one effective moment Orson Welles, trapped in The Third Man, stares in extreme close-up down to where tiny, distant Graham contracts and shudders in Deaths and Entrances. The links are sometimes facile: Graham and Erick Hawkins grappling—also in Deaths and Entrances—and Joseph Cotton trying to throw Teresa Wright from a moving train in Hitchcock’s Shadow of a Doubt have little in common but their 1943 date. Many of Graham’s great dances of the 1940s, and some later ones, merit the heading “Inner Landscapes,” powered as they were by Graham’s interest in myth and Jungian psychology. Night Journey (1947) and the somewhat abridged Deaths and Entrances (1943) were the two chosen for the Joyce season (appearing on separate programs). You can also interpret her powerful 1930 solo Lamentation as revealing her inner landscape. And, stretching a bit, her 1939 comedy Every Soul is a Circus. Blakeley White McGuire in Every Soul Is a Circus. Graham took the title for Circus from Vachel Lindsay’s 1928 poem of that name, finding inspiration in the lines “Every Soul is a circus,/ Every mind is a tent,/ Every heart is a sawdust ring/ Where the circling race is spent.” In this charming, frolic-with-an-edge, Graham cast herself as Empress of the Arena—one part a dithering choreographer like the one she later portrayed in Acrobats of God, one part a woman enjoying the attentions of two men. In 1939, she had just acquired a second male dancer, Merce Cunningham, whom she cast as a prancing acrobat in charge of a string of frisky pony-girls listed as Arenic Performers. Erick Hawkins strutted around, cracking his whip as the Ringmaster (perhaps a composite of himself as Graham’s lover and Louis Horst, her longtime partner and musical director, who masterminded her into modernism). An alter ego, billed as the Ideal Spectator (played on opening night by Carrie Ellmore-Tallitsch), watches the proceedings —changing hats, or putting veils over her head in inscrutable responses to the goings-on. The cast I saw featured Blakeley White-McGuire as the Empress, Tadej Brdnik as the Ringmaster, Lloyd Knight as the Acrobat, and Xiaochuan Xie as the favored Arenic Performer. In a 1970 revival, when Patricia Birch appeared as a guest artist in Graham’s role, I didn’t notice how clever Graham’s jokes were. The piece makes hay with elaborate build-ups to stunts that seem anticlimactic. Either that, or they fizzle without comment. Red drapes of various sizes conceal props as they’re brought in and also function to veil and unveil acts. White-McGuire stands on one leg with the other stuck out to the side. Brdnik holds up a curtain to conceal her from view, then whips it aside. Whaddayaknow! She’s still standing with her leg in the air. One of her solo turns (in an array of fetching costumes) involves figuring out how to dance with a red ribbon tied to one ankle —pulling on the ends to make her leg go places (I am my own puppeteer). Blakeley White-McGuire as Empress of the Arena, (background) Carrie Elmore-Tallitsch as the Ideal Spectator. Brdnik, hair slicked down, is appropriately self-satisfied as he swishes his phallic whip around and pulls White-McGuire into a sort of tango that also entails playing pattycake (the music is by Paul Nordhoff). Knight is a nifty jumper. The heroine finds him interesting. When he kneels, she pushes repeatedly on his chest; he leans obediently back, but bounces right up again like those inflatables you can punch over and over. Still, it’s the Ringmaster whose goading she needs. In the end, she’s alone—back on the couch where she began, enthroned but beset by doubts. Graham was a matchless comedian; her timing, the subtle way she changed her gaze or made a small adjustment in her position told much, without exaggeration or clichés. Blakely-White McGuire is marvelous at capturing those doubts and the flippancy; her body is alive with them (although she uses a few too many facial expressions for my taste). 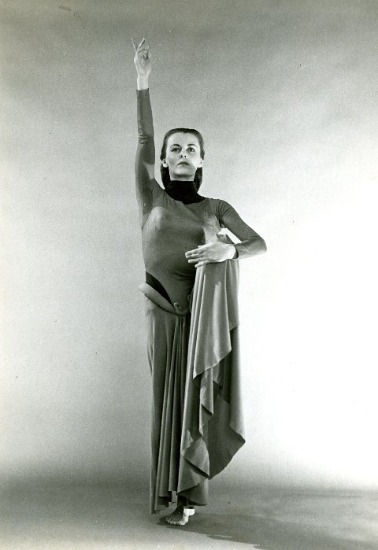 Under Janet Eilber’s direction, the Martha Graham Dance Company has commissioned several choreographers to create short variations on Graham’s 1930 solo Lamentation. A 1941 film of Graham performing moments from the dance for a camera serves an introduction. There are seven variations to date (regrettably, I missed Yvonne Rainer’s, a premiere). It’s an interesting exercise. Richard Move’s solo for Katherine Crockett has her slowly crossing the stage on a path of light, as if on the edge of an emotional precipice. She’s not wrapped in a tube of fabric like Graham, but grief presses on her. Graham sat on a bench almost throughout Lamentation. The two women in Aszure Barton’s duet sit separately—side by side, but not close to each other. They club a lifted foot or cup a hand the way Graham did, looking at each other only once, as I remember. Barton’s choreography is spare—enigmatic but moving. Orihara, as always, performs eloquently and without artifice, while the emotions of her partner, Mariya Daskina Maddux, seem more feigned. In the end, Orihara has moved to the back of the stage and is facing a new distance. Lar Lubovitch’s expressive new variation employs two soloists and a chorus. On a bench at the back, Samuel Pott helps Xie mold herself into mournful images, yet himself becomes enmeshed in these sculptures of despair. Lying the floor in front of them, ten other company members, partially covered by abbreviated versions of the stretch-jersey tube Graham wore, push and twist against the fabric that shrouds them—always in unison, a lake of grief. 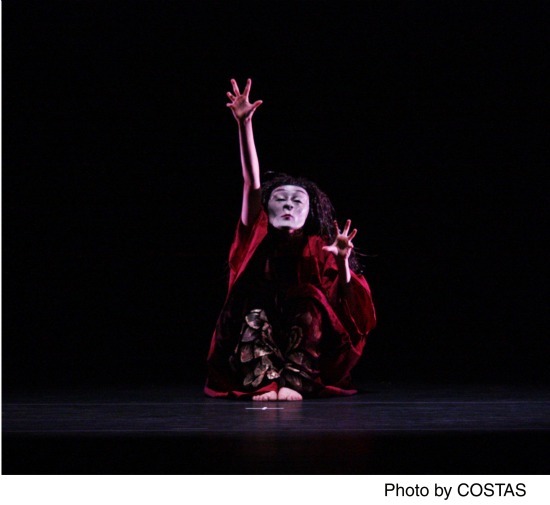 PeiJu Chien-Pott in Mary Wigman's Witch Dance. 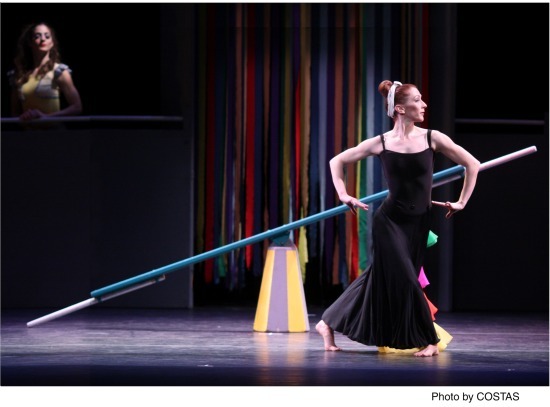 Another recent project of the company’s has been to stage works by choreographers once associated with Graham as dancers (an excerpt from Anna Sokolow’s Lyric Suite appeared on the program I didn’t see). This idea has been expanded to include Mary Wigman’s 1926 Witch Dance—perhaps to show that another modern dance pioneer was getting in touch with her inner demons the same year that Graham was making her choreographic debut in New York with more genteel dances. The first part of the great German’s hair-raising solo was preserved on film, but, other than that, written descriptions, and some photos, the dance has vanished. Scholar Mary Anne Santos Newhall is one of several who have attempted to reconstruct and flesh it out. The masked, seated figure with its clawing hands and greedy gaze certainly comes alive onstage; the brocade smock conceals a monster. I question one or two of Newhall’s decisions—not from a point of view of certain knowledge, more from a sense of what Wigman might or might not have done. The sound score by Jack Manno seems loud and harsh, and on opening night, Chien-Pott, powerful though she is, missed some of the rhythmic coordinations visible in the archival film. At the premiere of Night Journey in 1947, Graham, as Jocasta, danced with her considerably younger lover, Hawkins, as Oedipus. The stupendous piece hinges, though, not only on Oedipal lust, but on the fragility of memory and fateful decisions. As the dance begins, the heroine is about to commit suicide when the seer Tiresias interrupts the act—urging her to look back on the events that led her to wed a man who (unbeknownst to her or him) was her son. Throughout Oedipus’s aggressive wooing (he conquered the kingdom, he gets the queen), you see her having warning flashbacks she can’t quite understand. Graham’s choreography brilliantly shifts the images in their duet so that she seems now bride, now conquest, now mother. The processes of memory are doubled; in recollecting her past, Jocasta rediscovers the moments when she might have guessed Oedipus’s identity. Finally she tightens the rope around her neck and falls. The opening-night performances were, at times, electrifying. Crockett—tall, lean, and gorgeous—doesn’t have the whip-lash fervor of a smaller, sturdier woman like Graham, but she imbued Jocasta with passion and nuanced misgivings. Brdnik wonderfully conveyed the combined innocence and insolence of a boy conqueror. Their coupling was heated (if rather too messy in terms of Graham style). Pott, hunched over his staff, seemed to be playing Tiresias as infirm, rather than simply blind, which took attention off his role as a messenger and made you wonder about hisinner life. The chorus of women, led by White-McGuire, jumped like eagles and contracted their rib cages until you feared for them. Two events need mentioning—one a cause for celebration, the other for mourning. I regret that I was unable to see Orihara’s Jocasta on March 18th. That night, the company honored her 25-year career as a Graham dancer. Chosen by Graham in 1987, she’s the only current performer to have worked with company prior to the choreographer’s death in 1991. I wonder if Graham saw in her the flame-like power she eventually brought to Graham’s roles in Appalachian Spring, Deaths and Entrances, Cave of the Heart, and others in the repertory. Occasionally dancers performing Graham works assume a kind of mannered grandeur; Orihara never does. Like Graham in her glory days, she probes the interior life of the characters she plays, intent on the reality of each instant as it occurs. Years earlier, Ethel Winter, who died on March 10th at 87, also inherited Graham’s roles in such works as Appalachian Spring and Night Journey. She joined the Martha Graham Dance Company in 1944 and was only 21 when she appeared as one of the young lovers in Graham’s enigmatic Jungian Dark Meadow (1946). At the premiere of Night Journey the following year, she raged among the Daughters of the Night. Winter was luminous as the Bride in Appalachian Spring, the Girl in Red in Diversion of Angels, and the central Joan of Arc in Seraphic Dialogue, but she also had the depth and versatility to portray a flirtatious Cleopatra to Paul Taylor’s Antony in One More Gaudy Night in 1961 and a very naughty, scheming Aphrodite in Phaedra the following year. Students at the Graham school, where Winter taught on and off until 2006, and at the Juilliard School, whose faculty she graced between 1953 and 2003, knew her for both her sweetness and her strength. Hail, Ethel, and farewell. Your last paragraph made me weep, Deborah. And while you speak with empathy and eloquence about the current didactic, filtered, and I venture to say patronizing direction of the company, I frankly resent it, not only on my own admittedly knowledgeable behalf, but on behalf of the audience, which ought to be trusted much more than it is: the response to Night Journey you describe bolsters my case. Actually, that’s something Arthur Mitchell taught me years ago, when I sat next to him here in Portland during a DTH performance for school children during which they were gripped by Glenn Tetley’s Voluntaries, which has no story; you could have heard a pin drop. After it was over and while the kids (elementary school age) cheered the dancers, I told Mr. Mitchell how surprised I was. “If it’s good, they will like it,” he said quietly. Nothing abstract or plotless about Graham’s work, which speaks to the human heart loudly and clearly, if the performance is good. With great respect to both Martha and Deborah, I disagree that it is patronizing to put Graham dances in context with other work. Of course the best Graham choreography speaks for itself. But we don’t expect to see Balanchine isolated from the work of other choreographers, so why should we expect that of modern dance? With much of the early modern canon lost or on the brink, I think it’s a great service to audiences to see dances they might otherwise never know. I wish I had been there. Thanks for your writing that makes me have a real sense of the performance. I am so glad to be able to enter this discussion! Deborah, I welcome your questions about the Witch Dance as performed by the Graham Company this March. I consciously call it a “re-creation based upon Mary Wigman’s 1926 Witch Dance” because, as you say, there is no definitive documentation of that work nor have I found anyone who saw it as performed by Wigman herself. As to Deborah’s question regarding the music: when I started my study of the Witch Dance my intention was not to make a dance for performance. My desire was to try to understand Wigman’s working methodology. I also clearly heard Wigman when she said her goal was decidedly not to make “little Mary Wigmans.” I had a souvenir booklet from Wigman’s 1932 performance in San Francisco. The booklet included Eve Gentry’s first-hand notes, the instrumentation for the Witch Dance and some bars of the music written by Will Goetz, who was her accompanist for the 1926 version of that dance. (Hanns Hasting came later and ended up taking over her studio – but that is another story.) I also found Rudolf Bach’s 1933 text that describes the dance in vivid detail, including lights and sound. I translated Bach and shared all of this with my teaching accompanist, Jack Manno. We went into the studio to try to find how Wigman worked with Goetz. Through a string of synchronous events, the first of which was learning that Jack’s ex-wife Sarah had studied with Wigman in the 1950s, we re-created the beginning and went from there with Bach’s description and Goetz’s notes. One key to Wigman’s process, we learned, was that the musician follows the dancer, not the other way around. Of course, this creates a particular challenge for performance in our day of recorded music. Over the last 14 years of researching Wigman and performing this re-creation, the movement, mask and costume have all undergone evolutions and I hope that development will deepen. Details of the initial and subsequent processes can be found in the Society of Dance History Scholars conference proceedings from 1998 at Eugene, Oregon, or in my book and dissertation. I don’t want to take too much space here but there is much more of the story to tell and I would be more than happy to do that with anyone who is interested. I don’t believe Sheila that I said it was patronizing to put Graham’s work in context with other work of her times; certainly I didn’t mean that, nor do I think it. What I find patronizing about the current direction of the company is the verbal explanation of her work at concert performances; Graham’s work, above nearly all others, speaks for itself. The implied ’cause and effect’ relationship is weak, but this does serve to remind us of the general cultural context of the time — I’ve no idea if Graham watched Hitchcock, or if Hitchcock watched Graham, but many people in those audiences watched both.